Dauria wetlands support globally significant populations of at least 20 bird species on the IUCN Red List of Threatened Species, including the Red-crowned Crane, and resting and feeding areas for several million migratory waterbirds. Indigenous 30-year climate cycle effectively drives dynamics of Dauria ecosystems, but multiple manifestations of global climate change are also very evident there. Recent rapid socio-economic changes and loss of nomadic lifestyle in Dauria Steppe makes ecosystems and local communities less resilient to naturally fluctuating availability of resources and to droughts and floods exacerbated by climate change. Drastically different cultures, population density and mode of economic development and water use in Russia, China and Mongolia, make it very difficult to build transboundary mechanism to protect common water resources. 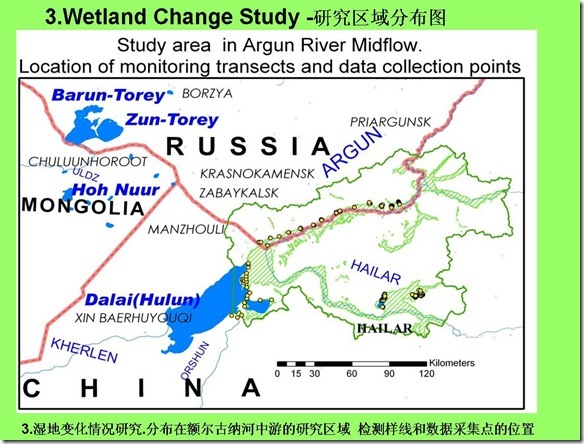 Meanwhile risks for wetland ecosystems and dependent population are further exacerbated by recent proposals for several inter-basin water transfer projects in the Argun River basin in China and Mongolia. Dauria International Protected Area (DIPA) was created by Mongolia, China and Russia in 1994 to protect and study ecosystems of the region. All three countries also have bilateral agreements on transboundary waters, which lack clear mutual obligations. 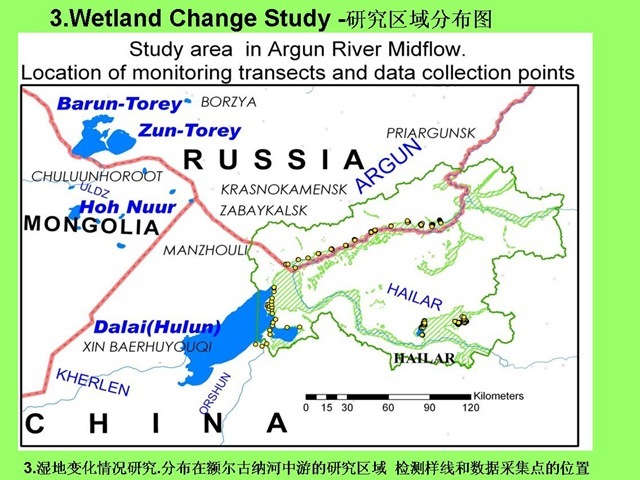 Increasingly altered by human activities Argun River basin with Dalai Lake and still relatively pristine Uldz River basin with Torey lakes form a great comparative pair for a study on transboundary water management options and climate adaptation in Amur River Headwaters. 4. -Awareness raising program on climate adaptation in transboundary Dauria. The project seeks to develop and promote science-based adaptation measures to complex cycling climate of Dauria region, which is severely affected by global warming. The project addresses domestic and international policy-making, as well as selected conservation and monitoring practices in the field. We also seek to create a platform for scientists from interested countries to advance understanding of dynamics in Dauria ecosystems under climatic and anthropogenic influences. 1) Analysis of climate change influence on hydrology in Argun , Onon and Ulz River basins has been started based on hydro meteorological data, remote sensing data and field observations. Data on Torey lakes water regime, area and shape dynamics were derived from satellite imagery, Torey lakes water balance calculated for 1960-2009. WWF Mongolia contributed study on climate change projections in Dauria for 2020, 2050 and 2080 determined by models HADLEY and ECHAM and possible consequences for 3 transboundary rivers (Khakh, Kherlen and Onon). 2) Data collected on habitat and biota conditions on key water courses and water bodies during the dry phase of climate cycle. Hydrometeorologycal data for the entire period of instrumental observation were obtained and are available for needs of the pilot project. Formation of ecosystems monitoring network was completed in the transboundary part of Argun and Onon rivers and Torey lakes basins. The netwok includes more than 200 wetland and steppe monitoring plots and transects in Russian, Mongolian and Chinese parts. In collaboration with the Institute of Natural Resourses, Ecology and Cryology of Russian Academy of Sciences hydro chemical and hydrobiological field studies at 11 lakes of the basins were carried out. An agreement with WWF Mongolia for complex monitoring (climate, hydrology, biota, human activities) of Uldz river basin as a model basin with natural flow was achieved. Complex ecosystem monitoring will make possible understanding of natural and antropogenic processes in the basin and estimation of natural and human contribution to the landscape dynamics. It will give information for developing of climate adaptation strategy and can be the tool for controlling of its realization. Within the framework of the information collecting improving a training seminar on environmental analysis of botanical data was held in the Daursky reserve. 4) Analyzed datasets on multi-year observations of wetland plant communities succession, abundance and breeding success of waterbirds, etc. 6) Started establishment of International Bird Observatory: agreed on common monitoring protocols, developed network of observation points for bird migration and nesting periods. 7) Delivered Project-related reports at 6 international conferences and published 8 short papers. 8) Sustained collection and dissemination of project -related information via English and Russian -language web-sites: www.arguncrisis.ru, www.dauriarivers.org (web-site in Chinese under construction). Project representative took part in official Russian inspection of the Hailaer river-Dalai-lake Water Transfer Canal and developed report recommendations on the outcomes. It was the first case of such international inspection between Russia and China. The inspection has shown that that the China water authority is ready to take measures to limit water-transfer volume but is not ready to tolerate international control and to monitoring ecological consequences of the water-transfer. Water management plans at Kherlen River basin (Mongolia), including including dam building and water transfer to Gobi desert, were examined, and an expedition to proposed dam sites on Kherlen Rriver was carried out.